If you are giving a gift to several people, start by baking a big batch of Hallmark stylist Andy Newcom's Christmas Cookies. 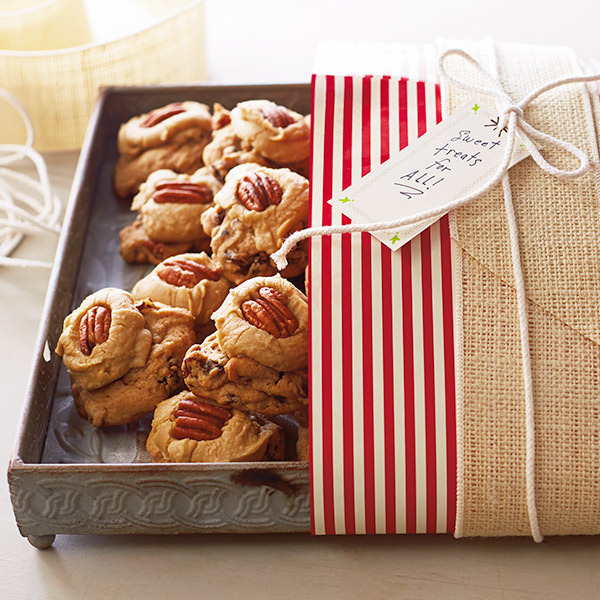 Brown sugar, raisins and pecans or walnuts provide a rustic, nutty flavor to the cookie dough. Spoon the buttercream icing over the top to complete the cookie sensation. No one said you have to give them all away! Put shortening in bowl and mix in brown sugar. Add eggs one at a time and mix completely. Add dry ingredients, and mix thoroughly. Drop by teaspoonfuls onto cookie sheet and bake for 10 minutes or until cookies get slightly golden brown. Let cool. Add brown sugar and stir continuously. When the mixture starts to boil, keep stirring and let boil for 2 minutes. Then, stir in cream and bring mixture back to a boil. Remove saucepan from heat and cool until lukewarm. Gradually add sifted powder sugar, and stir until smooth. Spoon over cooled cookies and let icing cool; top with walnut or pecan halves if desired.